Media and Contents: 241 parts (225 in grey styrene, 10 clear styrene, 5 black vinyl tires, 1 black nylon string). Advantages: First kit of this vehicle in this scale; one of the most widely used US trucks of the 1950s and 1960s; choice of several options. Disadvantages: An M37B1 and not an M37 (see text); cannot be made as Canadian versions as it comes. The three most popular and widely used US made vehicles in WWII were the 1/4 ton 4 x 4 or Jeep, the 2 ½ ton 6 x 6 GMC CCKW, and the 3/4 ton 4 x 4 Dodge WC series trucks. 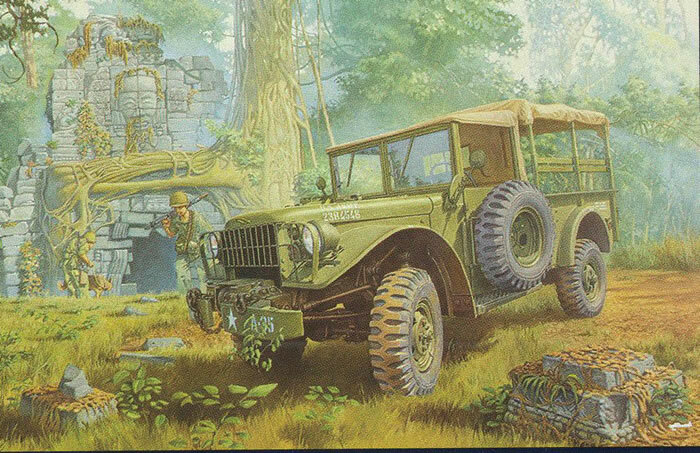 After WWII ended, the US moved to upgrade and modernize all three which resulted in the M38 series Jeeps, the Reo M35 series trucks, and the Dodge M37 series trucks. There were four basic versions to the new truck: the M37 cargo truck, the M43 ambulance, the M42 command version, and the M56 chassis for special purpose vehicles. A fifth model, the XM152 hard body version for special purpose use, was not adopted by the US but was later adopted by Canada. Between 1951 and 1968 more than 115,000 were built in the US alone as well as another 4,600 for Canada split between US and Canadian construction. The vehicle was widely used as a light support vehicle, shelter platform and personnel carrier by nearly all field forces of the US Army and the US Marine Corps. While not particularly fast (about 50 mph was all they would do) they were sturdy, reliable and could tow more than 3,000 pounds of cargo over nearly all types of terrain. There were two basic versions: the M37, the initial production vehicle, and the improved M37B1. The main difference between the two initially was the fact that the M37 carried the spare tire inside the body with a small folding jump seat behind it which could be used if the spare was removed; the M37B1 had some modifications, but the main one was the use of a folding spare tire carrier that fit across the driver’s door. Some were later upgraded and one seasoned hand said the original ones could be identified by the presence of the jump seat in the back. A second latch was mounted inside the body for the driver to open the swing-away mount for entry and exit. Canadian models were quite similar but had a larger engine (251 cid versus 230 cid) and an insulated hard top as standard fittings. There have been two kits of Dodge WC vehicles out - one from Peerless Max from 1974 and a much more recent one from Skybow (now AFV Club). But this new kit from Roden is the first one of the M37 series. Note that they only offer the US version of the M37B1 with the side door spare tire mount and no Canadian hardtop – all canvas. Roden kits are made in the Ukraine and are much harder to find that others, but happily my old friend Wes at Hobby Works Bel Air (MD) found a supplier and provided me with the review sample. But the kit is worth it and very nicely done. While it only builds a US built M37B1, it has many different options. These include winch or no winch, full canvas tops for the cab and body, open bows for both cab and body, optional position doors and windows, and full engine with optional position hood. Construction starts with the wheels, front axle and steering gear, but this is fixed. Note that the wheels are the correct “split rim” type but the splits are missing from the rims; these can be added by a razor saw but take care not to cut too deep. Shocks are nicely done with separate mounts. The engine is a very nice subassembly of 20 parts. The directions appear to note that two “wings” at the rear of the block on the oil pan (13A) need to be removed before mounting the transmission and transfer case assembly. Also note that parts 20A and 35A are the power takeoff for the winch and can be ignored if you are building a “straight” truck. Steps 12 to17 cover the assembly of the front bumper or bumper with winch. Step 19 covers the cab interior and the kit provides both all of the levers and all of the pedals for the vehicle. (I did not have a winch on 335 16 so cannot tell you which controls to leave off if not using the winch...) Part 17B is the cowl air vent so can be assembled open or closed as well. The body assembly starts with Step 20 - the curious part 5C is the bump over the inlet for the gas tank filler neck. The doors are nicely done with each one having six parts - inner/outer halves, window, handles and crank handle. The canvas top (1-2-3C) is well done but no “roll-up” options for the front or rear are offered or the sides. There are a lot of details on the front of the cab as well as the steering assembly so care must be taken. In Step 29 note that the seats may be mounted folded up against the top bows if desired - the seat braces (9D) then hang down from the inner edge of the seats. The model comes with three finishing options: unlike other vehicles the biggest thing to remember is that the ENTIRE vehicle is olive drab to include the engine and transmission components! Choices for markings are: AI 161st Field Artillery A-35, early Vietnam war; 130th FA Group A35, Vietnam (this vehicle is with winch); RCAF, Korea, 1953 (registration number 432A52-1094). A small sheet of decals is included. Overall I am personally happy to see this kit arrive and will build it up as the one which nearly caused my demise! Hopefully Roden will follow this kit with a model of the M43 “Crackerbox” ambulance or a hardtop Canadian version.